ORLANDO — To the victor goes the spoils and on the first Friday in December, the Champagnat Lions (14-0) played the Victory Christian Storm (10-4) for the right to be crowned the 2013 FHSAA 2A state champion. 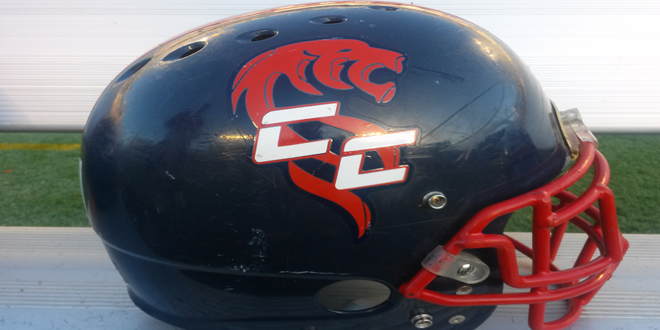 By the end of the game at the Florida Cirtus Bowl, the Champagnat Lions came away with a 14-7 win over Victory Christian and remained undefeated, the first time in school history. “The defense did amazing … we just couldn’t get the offense on track until it was too late. It’s a credit to their staff. We have been here time and time before and this doesn’t change us. We earned the right to be here and I’m proud even in defeat,” said Tommy Lewis, head coach of Victory Christian. Both teams boasted offenses that could put up points but in the first half, neither team’s group could gain enough traction to make an impact. The Storm opened the game receiving the ball first but did not do anything with the ball. After a short punt, the Champagnat offense displayed their athleticism on an eight play scoring drive. The Lions, after only gaining one yard in three plays, opted to go for it on 4th down and converted when Kato Nelson found Darnell Salomon on a quick slant that was completed for 12 yards. Following another nice pass to Calvin Foster, the Lions went to a ground attack with Michael Fredrick. Fredrick found the end zone with 7:04 left in the first quarter. With a missed opportunity on the 2-point conversion, the Lions took a 6-0 lead into the second quarter. Defense prevailed for both teams all quarter as both teams forced turnovers and got in the backfield for sacks. The Lions did have a chance to score with 2:12 left in the quarter, but Fredrick coughed up the ball and Victory Christian recovered the ball deep in their own territory. But the Storm did not hold on to the ball for long. Victory Christian’s Caleb Lewis threw a pass that was intercepted by Calvin Foster to close the half. After the half, it seemed the offensive explosion would begin. Champagnat used 11 plays to march down the field and score again on a Fredrick run. This time Fredrick ran it in from 10 yards out. Adding the 2-point conversion it put the Lions up 14-0. But for the rest of the third quarter, neither teams defense would break. Victory Christian suffered from a combination of bad breaks on plays and the growing threat of injury that slowed the game. Both team’s players suffered from heat cramps. Although the Storm offense got rolling, a pivotal interception early in the fourth slowed the momentum Victory Christian gathered. But as they did the whole game, the defense of the Storm help secure possessions and chances for the Victory Christian offense. Quarterback Caleb Lewis lead his team down the field with a little over 8 minutes left on the clock with calmness and precision. He managed to throw for 52 of his 165 game high passing yards on the drive. Lewis finished the drive off with a 1-yard run in with 6:24 left in the fourth quarter. Champagnat would lead by 7 in the closing moments of the game. After three exchanges of possessions the Storm offense took the field with 2:11 left and a chance to tie the game. Victory Christian stormed its way all the way to the Champagnat 19 yard line with over a 1:20 left in the game. Champagnat Head Coach Mike Tunsil talks to the media after the game. 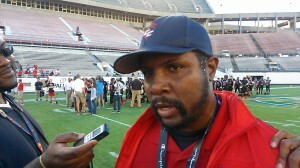 Champagnat won the FHSAA Class 2A State Championship 14-7. After a sack and two passes that fell incomplete, the Storm offense called timeout to ensure a play for a fourth down chance to gain yardage to either get a first down or score. 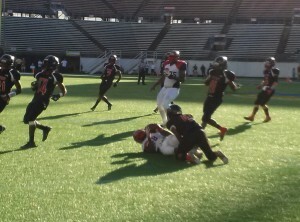 With pressure in his face, Lewis threw an incomplete pass that sealed the win for Champagnat. “This is a testament to us working hard. It has been a four year journey to this point and my guys did it,” said head coach of the Lions, Michael Tunsil. After going 2-9 last year the Champagnat Lions completed the journey of worst to first with the 2A state title win over the Victory Christian Storm and marked the first state football title for the team in only their fourth year of existence.